I'm a skeptic. Whenever I see a product that claims to enhance my feeling of awakeness, I just don't believe it. Seriously, how can a body wash actually make me feel like I slept more than 5 hours? Well, Dove Go Fresh Body Wash in Energize Grapefruit & Lemongrass honestly does the trick. I decided to put this body wash to the test one morning when I not only got less than 7 hours of sleep, but had a night interrupted by many bouts of restless REM. I woke up feeling tired, cranky and with the beginnings of a migraine -- not the best way to start my day, let me tell you! Well, two minutes in the shower with this body wash and I'll be darned if the yawning, achiness and tiredness just left me completely. I'm serious ... I haven't felt this alive in weeks! The fresh scent of grapefruit and lemongrass is honestly so energizing. There is no other word for it. The citrusy scent just makes me so happy every morning. Not to mention the fact that this body wash is utterly creamy and packed with tiny moisturizing beads that leave my skin feeling silky smooth. There just isn't anything bad to say. 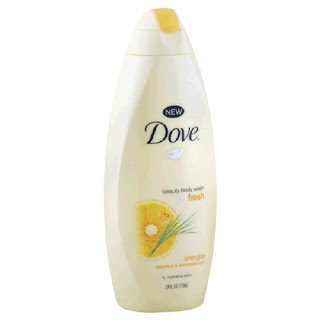 Dove Go Fresh Body Wash in Energize Grapefruit & Lemongrass retails for $8.79 at drugstore.com. Anonymous: Yes, you must! Check it out and report back to let me know what you think. so i stumbled upon ur blog and read about the dove body wash and i could not agree with you more!!! the best body wash ever invented! come by and check my blog and do the same if you'd like!